The Pattaya Vegetarian Festival will take place this fall, and a meeting of the organizing committee recently took place at Pattaya City Hall to decide on the format. Deputy Mayor Verawat Khakhay chaired the meeting, which also included Wuthipon Charoenphon, head of the Pattaya City Management Office, Somsak Puengmuang, president of the Chefs Association of Pattaya City and the East Coast, and officials from the Sawang Boriboon Thamasathan Foundation. 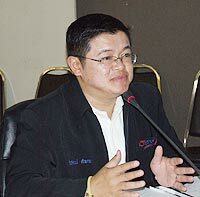 The Tourism Authority of Thailand Central Office Region 3 is also taking part in the organization of the event, which has become a regular feature of the Pattaya tourism events calendar in recent years. Verawat said that the festival would be centered on the Sawang Boriboon Thamasathan Foundation’s offices, Naklua House, and that the format would be the same as in recent years. A parade will be held during the afternoon of the first day, starting from Bali Hai Pier and progressing along Central Pattaya Road to Naklua. A highlight of each year’s festival is the mass cooking in a giant pan of a specific vegetarian dish that is distributed to participants, and the dish this year will be Emperor Noodles.